Yes, both organizations certainly have a touch of all of the above. For example, HR is certainly concerned about controls and compliance, especially when it comes to government regulations, but in general, the focus is much more employee-centric and focused on how to ensure employee engagement and a satisfying work environment. Finance, while also concerned about such practices, looks more toward ensuring that all of the numbers are in the right accounts and there is adherence to the bottom line. Let’s look at a few more examples of this divide and then see how we can better balance this relationship. When it comes to employees, there is a definite divide in the approach of both organizations. When rolling out a new process or a change, our experience has been that in general, finance will be more straight-forward about the change. It will focus on ensuring that it is working properly and it is compliant with the applicable standards and regulations. HR wants to understand how it will affect the employee. What is the experience in using the new process? If it is something as small as a tax change, HR may want to see a detailed communication as to how it affects the individual, while finance looks at it as one more change to implement. If employees want more information, finance feels they can scour the internet. Let’s take, for example, the potential change to the Form W-4. It’s certainly not the first thing on the mind of the finance department, and HR may not have knowledge of the impact it has on employees. 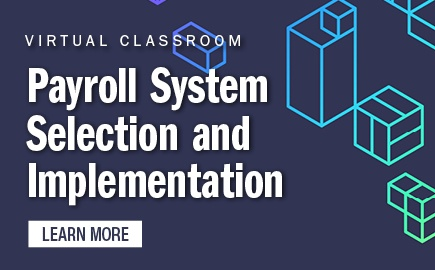 Payroll needs to educate both departments as to the impact on the employees, the potential increase in workload caused by these changes, software updates to our systems, and employee self-service programs, etc. While this appears to be a major project for payroll, HR and finance may look at it differently. We need to list all of the effects that a simple change in the W-4 form may have on payroll and share our project management worksheet with them, even though they are not impacted directly. Dealing with multiple year-ends can be time-consuming and draining, but if you prepare ahead of time, you will find the task is made much easier. In general, when it comes to a fiscal year-end the payroll department is not as involved as it is with the year-end close out. Payroll puts on its financial hat and looks to the accruals so that the proper accounting is in place. At a calendar year-end, not only do the accruals matter but there are the associated year-end tasks on which to focus such as getting all of the information in the system to get out a correct W-2 form the first time. So, what is the modern payroll professional to do to balance the draw of each of these “lovers”? Whether someone can love two people equally is open to debate, but it is possible to love both finance and HR and not drive yourself crazy. 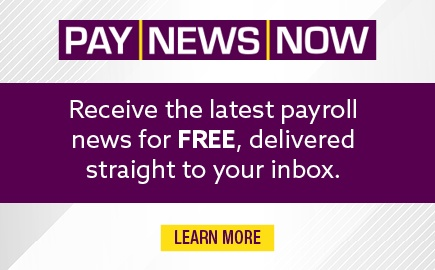 In fact, payroll is uniquely positioned to not only balance the needs of both but bridge the gap between the two and act as a mediator, understanding both sides and helping to find solutions. Given that the payroll is the largest single expense of most companies, payroll departments are tasked with being the guardian of that money and have a fiduciary responsibility to ensure it is handled correctly from beginning to end. We are also the department that is in regular contact with all of the employees through our efforts to ensure a timely and accurate paycheck each and every time. Supplying clearer and more understandable information to employees about any changes is to our benefit. It means fewer calls from people who don’t understand what is happening. We can use a little more of the “touchy-feely” attitude we attribute to our HR cousins. One simple action to take is to be more open in our communications. Since payroll is in the middle, we do need to be aware how impactful payroll is to both HR and finance. We are often the ones who can facilitate the sharing of information between both organizations. While confidentiality is necessary, and loyalty does have importance, we still do have a lot in common that needs to be communicated. To open those lines of communication, identify what each department expects from payroll. This will be different from organization to organization, but the leadership of each will determine such things as who is responsible for budget, compliance, and employee communications, etc. Identify the chain of command and work within those boundaries. When those lines of communication are established, we should educate all parties of the responsibilities we have not only to the departments but to our employees, government agencies (IRS, DOL), etc. We do not want to present this in a negative manner or appear to be complaining. A great way to communicate this is with a process flow chart. Show how things flow from HR to payroll to finance. Show where the checks and balances are appropriate according to the needs of the overall organization. This can be very helpful when trying to get a compliance issue addressed. Sharing the process flow chart gives everyone the opportunity to see the complexity of the payroll issues. It will, of course, open you up to suggestions and perhaps more scrutiny. But it’s better to address these issues than to have them continue to be a negative among all parties. Having a clearly defined process flow is important to payroll. It will define who we are, our responsibilities, who we look to for guidance on certain issues, and ultimately reduce the confusion for our employees. It does not matter to whom we report; what is important is both HR and finance are aware of our process operations, our daily responsibilities, and the impact of changes. It will be clear because we have educated them with our payroll expertise. This education is an important part of developing strong partner relationships. Educating our partners about our responsibilities is only one step. Communication with employees is very important to payroll and HR, yet might not be as prominent a concern to a finance department. When you report into finance, you can forget about the importance of this and lose sight of what our customer needs. Customer surveys can be shared with finance to help them in their understanding of employee needs. Also, they can help payroll develop better communication plans with HR, as sometimes HR likes to have significant input on the information released to employees to avoid any employee relations issues. As with any relationship, we need to look to the future of where our relationship will go, because life will continue to provide challenges. 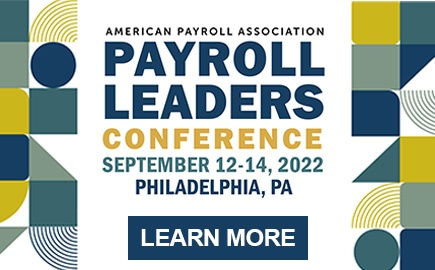 For payroll professionals, those challenges will be in the form of, among others, employee and manager self-service, big data, artificial intelligence, cybersecurity, and, of course, continued regulation changes (in particular—state- and local-level changes). These will advance that “just push the button” attitude even further. But as payroll professionals, we know that the data coming out is only as good as the data coming in. We will have to work with HR to address the education and training of our workforce to assure the data going in is accurate and timely. This will be particularly challenging with five different generations in today’s workforce. HR will want this information and technology for staffing needs and staffing benefits. Finance will want this information for cost analysis and budget. Payroll will be required to assure that the data is accurate to develop reports, budget analysis, dashboards, etc. It will change our job description as payroll professionals and has, in many instances, already begun. We will play a role as auditors and analysts as more and more data become available. Payroll will need to work closely with HR to assure individuals not only input the data properly but read the information correctly. Again, HR and finance will look at and interpret this data differently, and payroll will continue to be the relationship counselor. While we don’t necessarily have to love both organizations equally, we do have to communicate and share with them. After all, isn’t that required for any successful relationship to work? By acting in a professional manner, payroll can establish integrity and loyalty to both. And who knows? we just may even learn to love them without breaking any rules. Dennis G. Danilewicz, CPP, is the Senior Director of Disbursements Services at NYU Langone Medical Center in New York City. 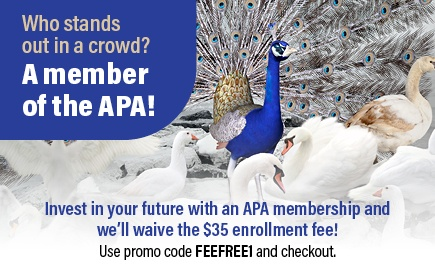 He is a former APA President, received the APA’s Meritorious Service Award, a Special Recognition Award, and was named Payroll Man of the Year in 2000. Danilewicz also accepted two APA Payroll Prism Awards for Best Practices (both for Management, one in 2007 and one in 2008) on behalf of his departments and is a member of the Board of Contributing Writers for PAYTECH. Ronald Moser, CPP, is Payroll/Employee Benefits Consultant for Taxing Matters who also has 31 years of experience with the Kenmore-Town of Tonawanda Schools as HR Manager. He is a member of the APA’s Ambassador program, a CHAMPS mentor, part of the Government Relations Task Force (GRTF) IRS Issues and Payroll Cards Subcommittees, the National Speakers Bureau, the Strategic Payroll Leadership Task Force (SPLTF) Government/Public Sector Best Practices Subcommittee, and a founding member of the SPLTF K-12 Educational Organizations Subcommittee.